It was in the early nineties when I spent considerable time each year in the United States escaping some of the cold months of winter in Austria. My being there followed the pattern of personal relationships, and the friends and family I was with had just moved from Arizona to Thousand Oaks, California. I had allready for four, five years had time to devour the effects of the big cultural shock that the encounter with the incredible size and extension of American Cities had brought to me from the first Moment I flew in over Chicago. I had learned a good deal about suburbia, and by being in Phoenix before had had the opportunity to discover and study Arcosanti. So I had several networks with knots that I repeatedly visited in my journey, and one of those knots was a very dedicated networker herself, Sandi Brockway of Macrocosm USA in Cambria on the pacific coast near San Louis Obispo. One day it happened that Sandi came the other way to Thousand Oaks and we decided to visit Louis Arkin   in her "ecovillage" in Central Los Angeles. Louis pointed me to the many "hidden treasures" in Southern California, among them were Tony Gwilliam in Ohai and Joseph Smyth in Thousand Oaks. So I stepped into Josephs spacy Thousand Oaks office space, located in the heart of what could be considered a little oasis in the suburban desert. Thousand Oaks at the time was and most likely is an affluent community where there is some sense of center and public areas, and maybe also one of the few places in the Greater LA Area where one can still take a real walk, enjoy sitting in a cafe and such. Nevertheless even here I felt the deeply disturbing fact that almost no human being could live without a car. Joseph Smyth argued it is not necessarily the people that prefer the single family home, it is rather the choice of the car. To summarize the effects of the car on society is not an easy task. Maybe a picture says more than a 1000 words: Los Angeles is a city which has been most dramatically changed by the automobile. What used to be a lavish, green agricultural valley has been sealed with concrete. 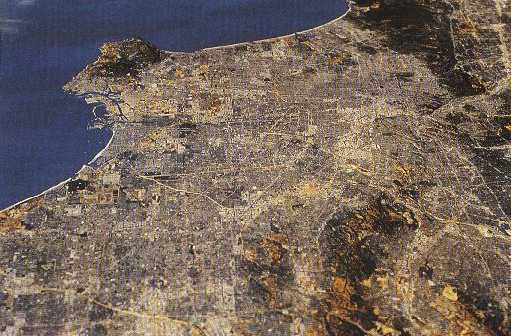 Therefore, the satellite view of Los Angeles today shows grey as the predominant colour. 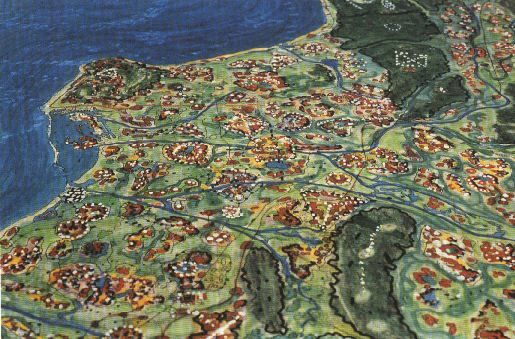 So the visionary painted another satellite map of a Valley of the Angels returning to its origins , showing what would be the outcome if we could substantially reduce the importance of the car in todays Cities. 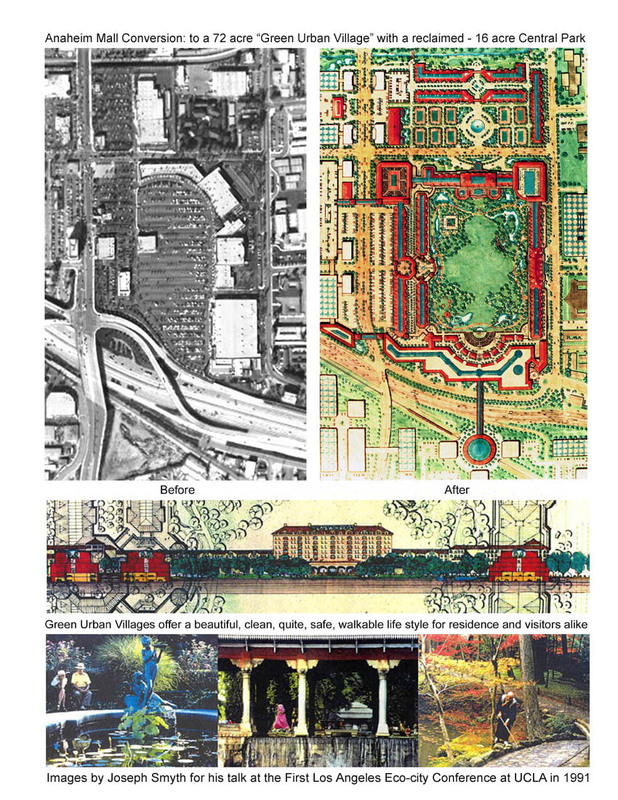 He showed a different Greater LA - a network of pedestrian oriented, clustered communities, born in a chaotic process of "Edge City Densification", which in a way remind us much more of a European land use pattern with dedicated subcenters, which provide in short reach access to public transportation, shopping, services and all kind of leisure activities. And as to zoom into this visionary picture, he showed me a plan to convert a mall in Anaheim that he had developed. Anaheim is a place near to Disneyland, and so is probably more part of the car - centered Los Angeles myth, a point of constant trafic and mass tourism. Combining residential functions with a shopping mall would enable the community to emerge as a strong center of life, would automatically attract other functions and would reduce car use greatly, allowing for the massive unsealing of Earth and the hosting of an oasis. Joseph seeked to tie this into plans of mass transportation and also include a station for a metropolitan railway line. See the lower part of the right image. In short: he gave an image of what integrated city planning could look like if there was a dialogue between developers and traffic planners. One could say that in Vienna we have good examples for this, Harry Glücks Alt Erlaa, the Trillerpark mall, the new developments in Simmering and Aspern. I happen to live and work all my life opposite Karl Seitz Hof where the students of Otto Wagner, among them Hubert Gessner, showed exactly this pattern to the world first in 1926. So later on when Joseph came to Vienna in 1993 people did not really grasp that his message went much further.